How to hit a baseball is easy to describe and difficult to do. Many sports fans feel it is the hardest thing to do in sports. 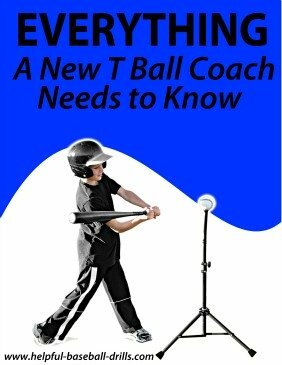 Just ask any baseball player, pro or youth, who is in a hitting slump and they will agree. In fact, they don’t have to be in a slump and they will agree. The old saying goes you are taking a round object, the bat, and trying to hit a round object, the ball. This is why a player with a batting average of .300 is considered a good hitter. The pitcher that pitches the baseball to you certainly wants to get you out. So he is throwing the ball in such a manner that he hopes you either miss it or you hit it lightly to a fielder. And if you are hitting .300, then he is winning the battle seven out of ten times. So you don’t want to just hit the baseball. How to hit a baseball means how to get a hit. You want to hit the baseball hard and level, or slightly elevated. This is where the hard work comes in. Being able to hit the ball square comes from taking lots of batting practice. 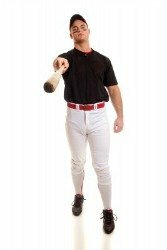 Before we get into the mechanics of a baseball swing, let’s talk a little about the baseball bat you are going to use. Choosing the right bat will help you hit better. You do not want a bat too heavy or too long, because you will have trouble swinging the bat around fast enough. And you do not want a bat that is too short or too light. You will not be able to hit the ball hard enough with a bat too short or too light. So how do you know the right size? About the best way to measure a bat for you is to hold the bat out straight, parallel to the ground. If you can hold with one hand with ease, then that bat is probably too light. If you struggle to hold the bat more ten or fifteen seconds, then it is too heavy. There might be a range of a few different sizes that will work for you. Try a few swings with each one and pick the one you feel most comfortable with. Don’t get in a hurry to make a decision on a bat. It is important that you have the right size. 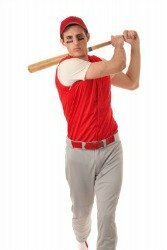 A batter’s baseball swing is a lot like a golf swing, you have to practice and practice some more to get better. A professional golfer who takes some time off has to go back to the driving range many times to perfect his swing. This is true of a batter. 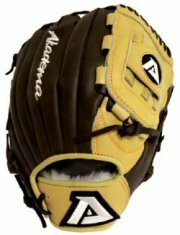 A batter needs to learn the basics of swinging a bat and then apply lots of practice with soft toss or a pitching machine. There are not many things in life more fun than getting a big hit in a baseball game. Sometimes just getting any hit is a great feeling. I’ve been there, lol. So let’s get into the details of how to hit a baseball. Up above I said a baseball swing is a lot like a golf swing. And the number one thing a person has to do with either swing is keep their eye on the ball. Hitting a baseball takes good eye–hand coordination, or some people say hand-eye coordination. Seeing the ball clear is the most important thing about hitting. I probably didn’t have to tell you that. But what is the best way to see the baseball? The only way to get a good look at the ball coming at you is by keeping your head and eyes still. You cannot be bobbing your head around and see the ball well enough to hit. Again, this just makes common sense. But lots of young baseball players will be shaking all parts of their body around while the baseball is starting to come at them. The next step of your swing to discuss is the load and fire motion. To hit the baseball the hardest you can, your whole body needs to be moving towards the ball. Many players help this movement by starting with a batting stance that has them leaning on their back foot. Then as the pitcher is about to release the baseball, they stride forward by lifting and stepping forward with their front foot. This is a very effective method that has become popular the last twenty years. You will see some players with a high front foot step, and others lifting their foot barely off the ground. Try both methods and find out which works best for you. The key is to find a step that you are comfortable with, and then learn to repeat the same step with every swing. All the practice you are going to need to do will only pay off if you can duplicate your swing over and over again. When you step into the batter’s box against live pitching, you want muscle memory to kick in so you can concentrate on the baseball flying at you. And the only way to accomplish this is from repeating the same swing every time in practice. How to hit a baseball turns into a lot of work. The last step of your swing is the follow thru. To accomplish having your bat going it’s fastest at the point of contact with the baseball, your swing must continue on around your body. Stopping the bat at the point of contact means you slowed the bat down before the hitting the ball. This is a big problem with many young players. 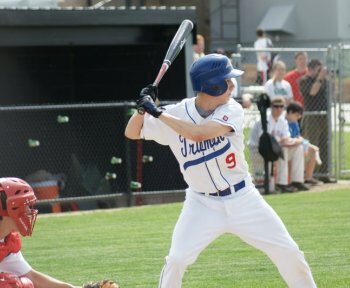 If you are a coach or parent, watch your player’s swing in a game and make sure he is swinging thru the ball. If you are the player, ask someone to observe your swing watching the follow thru. When you are watching for it, it is easy to observe. Where is his bat at the end of his swing? It should be practically wrapped around his neck. Anything short of this means he is not hitting the ball as hard as he can. OK, now you know the basics of how to hit a baseball. 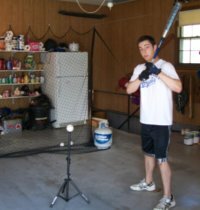 Take this information and head to the batting cages to perfect your swing. The only thing holding you back now is some valuable time swinging your bat. And here are more "Batting Drills".